So as I am the new kid around here I wanted to name my posts something that can identify them different to our glorious leader and I feel that right now being the new kid on the block sidekick is a good way to identify myself. 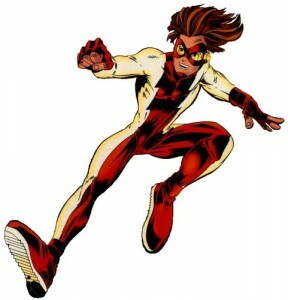 Kelson is the guy that channels the speed force. I am impulse to his wally at the moment. I might change the name later but for now I think it is a nice way to let you know when I am speaking. So this is the place that I will be looking at The Flash and his universe at the characters and events that have shaped each person that has worn the lightning. Ignition: the end of one age, the birth of a new one. So today I wanted to look at the Ignition storyline that begins with Issue 201 and what the story meant to the character of the Flash and the Flash universe in general. 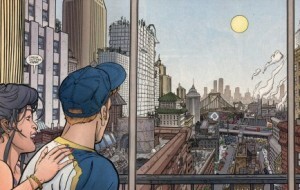 Ignition is an interesting issue from the perspective of serialised super hero story telling. It is a great example of how you can make large scale changes to the status quo and still maintain the integrity of the character and honour the audiences expectations. This is the reboot that I feel the people involved with “One More Day,” the Spider-Man story that was intended to create a new paradigm for the character. But where they failed with “One More Day,” Geoff Johns succeeded: execution. 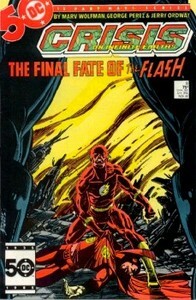 Geoff Johns took the subplot that ran through the Flash starting in the last half of Mark Waid’s run (the fear of loss) and used that theme as the reason for the changes made in this story. Mark Waid had stated several times that his fear with marrying Wally and Linda was that if he did that then the next writer to take over the character would just kill her off. This is interesting as when you look back at the 12 months prior to the wedding and all the way through till the end of Mark Waid’s run there is a fear that starts to touch the story. A fear at the loss of Linda. Linda and her well being have such a driving effect on Wally. This is articulated by Wally by stating that Linda is his beacon. The reason that he can return form the Speed Force. It is such a driving force in the book that the first thing that happens after Linda and Wally are married is that Linda is taken away. I feel that this is Mark Waid’s way of dealing with this issue. So then looking at Geoff Johns’ run on the book with Linda pregnant and the ordeal of losing the babies, it is the fear of loss again that drives Wally to change the world so that no one remember that he is the Flash. In the process Wally and Linda forget that he is the Flash and Linda carries a resentment for the Flash as she remembers that he was responsible for the loss of the twins. Ignition is a clever story, it uses the structure of a mystery to reveal the character and world of the Flash and is one of the best rouge reveals in the books history. It gave Geoff Johns a chance to integrate the supporting characters that he had been creating into Wally’s universe and linking them more closely with him. While not many characters are introduced in this story it is the moment that these characters feel linked to wally in a more natural way and Geoff Johns goes so far as to give Keystone city a personality all of its own. Something he did very well later with Coast City in Green Lantern. This storyline and reboot is one of the most important stories in the series. Firstly it creates the new Flash Status Quo. Something that really draws a line in the sand between issues before #201 and all that came later. There is a reasonable case to site Ignition as the start of a new age for the Flash. This is when Wally faces his greatest fear (the loss of those he loves) and creates something new. This is when Wally crosses the final threshold into adulthood, a process begun by William Messner-Loebs when he started as the writer of the Flash. Wally as an adult super hero. This is the milestone that creates that maturity. When you think about it, the character of Wally has been shaped by loss in a way that few characters have in the DC universe I think that it is fitting that loss it the catalyst that creates the next stage in Wally’s life. This age did not last long but while it ran it was one of the finest moments that the character has ever had. This entry was posted in Flash History, Opinion and tagged Geoff Johns, Guest Posts, Ignition, Linda Park, Mark Waid, Wally West on January 15, 2010 by Aldoth. well written. i enjoyed this as well due to the way it was executed. being that everything before still happened, but a new twist is added to adjust the now to help everyone, characters included “forget” key events and then new things play out. Respect the characters; use proper nouns. I think one reason why I, as a Wally West fan, can accept a Wally West retirement (as opposed to a Kyle Rayner-esque fade into the background existence) is that the character has now gained everything he has worked for. All the loss the motivated him, he has gained. He has his beloved Uncle/Mentor and Aunt back. He has a wife that loves him and two wonderful kids. I would imagine as a hero, he would become much less selfless thinking about his children. This does not make him less of a hero, this is a human fatherly instinct. He would want to keep his children and family safe first and foremost and he would be hesitant to give up his life in certain situations because he knows they need him. I think if they do want to put Wally on the Shelf, they can with a GOOD retirement story. It would provide us with closure. The man has a great life now. Wally always wanted a simple, normal life (until Barry died) and now he can have it. A good story can make me accept that. actually, i hated this story… and the following ones. i think there are two orders of problems with “ignition”. the first is that, despite what the very same johns had done until then, it banalized the character. wally west was a recognizable hero, with a “raison d’etre” of his own. for example he did the super-hero thing for a living, which was very cool and unique. johns himself contributed to that uniqueness by forging a very peculiar setting around wally, finally giving keystone a personality and bringing back the rogues. so, why go back to the same old same old secret identity stuff? the book already had a distinctive look and feel, and it was working, cause sales were going fine. barry allen syndrome, i guess: here’s another reminder that you shouldn’t fix what isn’t broken. at that time, i believe that if DC just relaunched the book the way they did later with JSA, sales would have spiked without silly retcons and stuff. the second huge problem here, but i believe it showed mostly in the subsequent issues, is that from this moment on i really felt like johns didn’t know anymore what to do with wally. or at least that he was forced by editorial to write something he hadn’t planned. i mean, just think about linda and iris: why did johns had linda go back to school in the first place, if he had to make her go back being a journalist like that? and what about weather wizard’s baby? and did wally’s new job add any weight into the story? i believe that every time you put something into a story, it has to be meaningful. you have to bring that storyline somewhere, you have to deliver. so, i believe after “ignition” the flash became just another comic book and lost most of his steam. .-= Mr. Kayak’s latest blog post: “Legion of Super-Heroes”: say, say, say… volume 6! =-. I liked the story itself as a nice change of pace, but I do agree that Wally lost one of the key elements that distinguished him from other Flashes when he regained the secret identity. Certain Barry Allen fans have been saying since 2005 that he was turned into Barry-Lite, so why not focus on the real thing? You could say that “Ignition” was the beginning of the end for Wally West, when Geoff Johns started putting him back into Barry Allen’s shadow, years after he’d moved on from it. 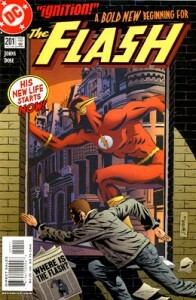 Just a theory, but I suspect somewhere around Ignition DC editorial decided the Flash should go back to its classic paradigm; the secret identity, the police force background, etc. In there the twins were undone and then redone, the reporter wife came back, and so did the secret ID. Then they realized Infinite Crisis would be the right vehicle to bring back Barry, making way for Wally’s retirement. And from there things got downright weird. I won’t argue that Ignition was a good read, but IMHO the whole ending of Blitz and the events taking place on Ignition are just a way to justify another Storyline: JLA – Crisis of Conscience. I hated Identity Crisis, I think that the only good it came from that book was the fact that writers started to worry about giving each DC character a distinct personality. Given the way that the DC Universe moved back in those years, I can’t help but to think that Johns wrote Blitz and Ignition as a way to justify Wally voting for a new mindwipe on JLA: Crisis of Conscience. Then again, several things didn’t make sense on that story, like Wally being a mechanic since he was a college dropout (from physics, none the less), but overall I enjoyed it.